Sometimes I find myself at the end of the day wondering where all my time went. Ok, it happens more than sometimes. This causes me to get frustrated at not getting done what I wanted to. It also leaves me confused about what I did and why my intent for the day didn’t match reality. An interesting quirk of my dyslexia is I can often find myself at the extreme ends of maintaining focus on what I am doing. I can be like a magpie with ADD. You might be forgiven for thinking that with my Journal practice I have a firm grip on what I want to achieve every day and I ruthlessly execute that. Or I rigorously implement kanban or time boxing to constrain the many possible tasks to the few important ones. I’ve blogged on time management for the neurodiverse and even on how to get the best from a bad day so I must be a productivity ninja – right? Not so much. Part of the reason I have tried so many systems is that I find some work better in some situations than others. Part of the reason might also be that I like shiny things. I look to systems to provide support in areas where my dyslexia/dyspraxia presents challenges. A downside with the way I journal (my current favourite workflow tool and a firm part of my daily ritual) is that it is more a statement of intent than a record of what actually happened. If I spend all day doing stuff that is not on the plan there is no record of it. Couple that with a poor working memory and it can leave me feeling deflated at the end of the day. Boxer Mike Tyson says everyone has a plan until they get punched. Quite often it can feel like life is dishing out punches and getting in the way of my best intentions. 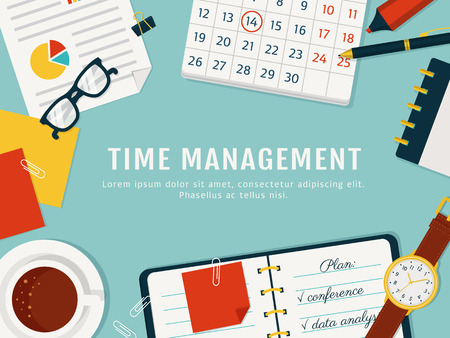 In time management for the neurodiverse, I briefly covered a Drucker Time Analysis. Very briefly. Practically as a foot note. Analysing where your time goes is a very powerful tool for uncovering why you don’t get done what you want to. There are countless apps for time tracking. Some apps also link into billing software for people who charge based on time. But I like old school and want to capitalise on my journal habit. 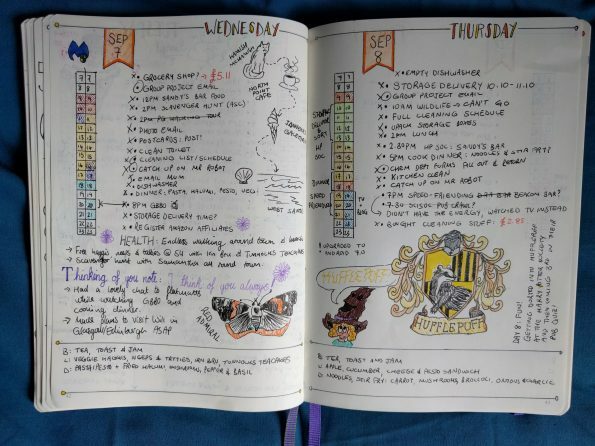 Tracking time in a BuJo is not a new concept but it was great to find this article on Bumbling BuJo. Even better still to get permission from Bee to reproduce the pic below. I recommend checking on the linked article as it has some great advice on tracking time. I find a time window of 15 minutes is a good compromise between enough information to spot patterns and too much data to spot patterns. Time tracking (unless you are using it for billing) does not have to be accurate. It is to help you spot where time is going to. I recommend capturing your time for a whole week as most people tend to have weekly cycles. If you have a natural fortnightly cycle it might be worth looking at a longer time window. If you do a record for a longer sample then analyse the results at the end of the first week to see what patterns emerge. This will help demonstrate the power of the system and secure your commitment to continue into the second week. You don’t have to stop recording your time after a week or to – it is it beneficial keep going. Most people who I have suggested a Drucker analysis to give up after the week due to the overhead of capturing the data. It’s just as easy to track time if you are not using a journal. Designer Dave Seah developed a printable emergent task planner and a blog on how to use it. If you are tempted by shiny new apps there are loads for smart phones and desktops that will capture the data. The key is to find something that works well enough to capture the data. If you are only doing it for a week spending ages finding the best time track is not productive. The results of a week (or even the first day) of time tracking might speak for themselves. I’ll post a seperate blog on how to do a more detailed analysis.